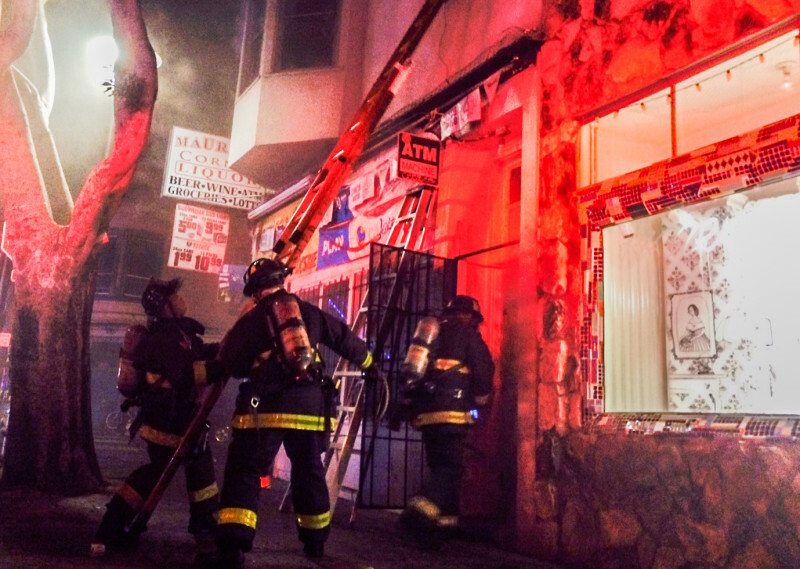 The industry association that represents San Francisco's landlords is backing a new Board of Supervisors proposal that would give city inspectors the power to force scofflaw property owners to install or upgrade fire alarm and sprinkler systems. Supervisor Hillary Ronen on Tuesday unveiled a set of measures that would allow the city's Fire and Building Inspection departments to order landlords who have failed to correct two or more safety violations to retrofit their buildings with sprinklers and alarms or improve existing systems. The proposal would bar landlords from raising rent to pay for the improvements. Property owners who fail to comply would be fined up to $1,000 a day in civil penalties. "We're going to require you to make your building safe, and that's going to be an expensive endeavor," Ronen said in an interview. Ronen's proposal comes after a series of major fires -- including two fatal blazes -- that displaced more than 200 residents in the Mission District, an area she represents. Unlike other proposals drafted in response to the fires, the largest of which occurred between January 2015 and June 2016, Ronen's measure has support from both tenant rights groups and the San Francisco Apartment Association. "Supervisor Ronen's proposal is severe -- installing sprinkler systems in existing buildings is extremely costly -- but it appropriately targets bad actors and will only impact buildings with a history of severe violations," said Charley Goss, a spokesman for the apartment association. "Ultimately the ordinance will improve the safety and living conditions for residents in some of San Francisco's most vulnerable and at-risk buildings, while building owners who maintain their buildings in good faith will not be impacted by the proposal," Goss said in an emailed statement. Tenderloin Housing Clinic Director Randy Shaw, who has criticized the city for moving too slowly in responding to fire safety concerns, said the proposal is a step in the right direction. But he said the city needs to go further. "I still think the city needs to begin a process of requiring sprinklers in apartments, especially wood-frame apartments of a certain age," Shaw said in an email. "More tenants have been displaced by apartment fires than by earthquakes, yet instead of sprinklers, San Francisco requires soft-story seismic upgrades that are expensive for owners and tenants alike," Shaw said. After fatal fires in early 2015, Shaw and other tenant activists called on the city to require older apartment buildings to be retrofitted with sprinklers, systems newer buildings are already required to have. Three people died in two of the worst blazes. One man died when fire swept through a three-story commercial/residential building at Mission and 22nd streets. The structure did not have sprinklers on two floors and at least two of its exits were blocked at the time of the fire. A second-floor apartment where two people died in a fire, at Treat Avenue and 24th Street, lacked smoke detectors. Those fires led to the creation of a task force that included top officials from four city departments. Months later the group issued a set of recommendations to amend San Francisco's fire and housing codes and to require improvements for fire alarm systems in older apartment buildings. The recommendations became the basis for legislation by Ronen's predecessor on the Board of Supervisors, David Campos, which eventually became law. But neither the task force nor Campos took action on requiring sprinklers -- despite Fire Department data that showed how effective the systems have been in preventing deadly fires. Ronen acknowledges that the city has not moved quickly to adopt safety improvements that seemed urgent immediately after the major fires of 2015-16. "I think the pace has been slow," Ronen said. "We were looking at more drastic reforms." While tenant advocates initially pressed for installing sprinkler systems in all of the city's older apartment buildings, landlords fought back, arguing that the retrofits would be too expensive and could lead to displacing residents. A late 2016 report by the Board of Supervisors' budget and legislative analyst said the city should consider requiring some older buildings to be "sprinkled" -- but also pointed out how expensive that work could be. Ronen views her measure as a compromise, but it's unclear how many buildings it would apply to. According to the Fire Department, about 500 commercial and residential buildings currently have fire safety violations that have not been corrected. The new proposal would focus only on residential buildings that have at least three units. Either way, fire and building officials say Ronen's proposal would give them a potentially powerful new enforcement tool. "The proposed legislation is designed to better protect the health and safety of the residents of San Francisco," Fire Department spokesman Lt. Jonathan Baxter said in an email. "We will support any legislation to protect the life and safety of the public," said Tom Hui, the director of the Department of Building Inspection. Currently, owners of residential buildings who do not correct safety violations can be subject to an agency hearing and face legal action by the city attorney's office.